1Department of Pathology, University of Pittsburgh, Pittsburgh, PA, USA. 2Department of Clinical Immunology, Odense University Hospital, Odense C, Denmark. 3The Institute for Transfusion Medicine, Pittsburgh, PA, USA. Received: November 4, 2016; Revised: November 20, 2016; Accepted: November 23, 2016; Published online: December 23, 2016. TO THE EDITOR: The whole blood (WB) and apheresis plasma donations are generally well tolerated but they are not completely without risk. While the majority of complications are mild and self-limiting, they can cause significant donor discomfort and negative impact on donor satisfaction and return rates . Vasovagal reactions (VVRs) are among the most common complications of WB and apheresis plasma donations. VVRs result from reduced cerebral perfusion and may be triggered by unpleasant or painful stimuli during the donation process, including the sight of blood, lack of sleep, dehydration, hypovolemia and hunger. Recent estimates for donor VVR rates range from 0.01–12.5% for WB donations [2, 3, 4] and 0.16-4.17% for apheresis collections [5, 6]. Studies comparing VVR rates between WB and apheresis plasma donations have reported conflicting results: Crocco et al. found similar VVR rates between WB donors (0.19%) and apheresis plasma donors (0.16%), while Burkhardt et al. reported lower rates of circulatory associated events (0.30%) in WB donors compared to apheresis plasma donors (0.49%) [3, 5]. There is strong evidence for association between higher VVR rates and first-time donor status, younger age, lower weight, and female gender [7, 8, 9, 10]. The level of evidence for other etiological factors, such as pre-donation anxiety, low blood pressure, collection volume, menstrual status, history of VVRs, longer waiting time, time since last meal, temperature/season, donor fatigue, donation site, duration of phlebotomy and staff interpersonal/technical skill is weak to moderate [11, 12, 13, 14]. The aim of this retrospective registry-based study was to determine the factors related to VVRs in a Danish cohort of WB and apheresis plasma donors. Volunteer donors fulfilling current Danish eligibility criteria underwent WB and/or plasmapheresis donations at the main hospital donor site, while whole blood donations were also collected at a five-bed satellite facility of the hospital. Pre-donation vital signs were recorded by the same donor center staff, who supervised plasma and WB donations at both sites. Apheresis plasma donations were collected using the PCS2 plasma collection system (Haemonetics Corporation, Braintree, MA, USA); 700 mL of plasma were collected if the donor's body weight was greater than 70 kg and 600 mL if the weight was between 60–70 kg. The minimum body weight for WB donors was 50 kg. Donor demographics, details of the collection procedure and complications related to the collection procedure from January 2, 2014 to August 10, 2016 at the Odense University Hospital were reviewed from the donation database (ProSang, Databyran AB, Stockholm, Sweden). Tests of normality were performed for continuous variables and the appropriate descriptive statistics were calculated. The Chi-squared test was used to compare the differences between dichotomous variables, a Wilcoxon rank-sum test was used to compare the mean rank between groups for non-normally distributed continuous variables and a two-sample test of proportions was used to compare re-donation rates amongst donors with or without the experience of VVR. A multivariate logistic regression, clustered by unique donor, was performed using VVRs as the dependent variable and age group, gender, donation type, donation site, donation number, season and donation volume as independent variables (Stata version 14, StataCorp, TX, USA). There were 54,542 donations (56.6% WB and 43.4% apheresis plasma donations) during the study period from 11,912 individual WB donors and 4,840 individual apheresis plasma donors (4,164 donors donated both WB and apheresis plasma). Donor demographics are shown in Table 1. During the study period there were 353 VVRs in 336 unique donors of which three donors who donated both WB and apheresis plasma experienced VVRs with both donation types. Two WB donors experienced two VVRs and 12 apheresis plasma donors experienced two VVRs. Although quite low overall, the VVR rate was almost 3 times higher in the apheresis plasma donor group compared to WB donors, perhaps due to the longer procedure time and extra-corporeal volume or fluid shifts during apheresis (Table 1). Analysis of the demographics for WB donors showed that the VVR rate was not different between male and female donors (P=0.490) but there was a trend towards a higher rate of VVRs in male donors less than 30 years of age (P=0.192) and female donors greater than 30 years of age (P=0.147), as shown in Fig. 1. The rate of VVRs was highest in WB donors at 17 - 20 years of age compared to other age groups (Table 1); the median age of the WB donors without VVR was 37 years (IQR: 25–50) compared to 23 years (IQR: 20–28.5) in the WB donors without experience of VVR (P<0.001). Analysis of the demographics for apheresis plasma donors showed that female donors experienced twice the rate of VVRs compared to male donors (mean VVR rates of 1.54% vs. 0.75%, respectively, P<0.001) and the trend was consistent across all age groups (Fig. 1). There was a bimodal age distribution of VVRs in apheresis plasma donors, with the highest rates observed in 20–29 year age group and 40–49 year age group (Table 1); the median age of the apheresis plasma donors without VVR was 41 (IQR: 28–52) years compared to 34 (IQR: 24–49) years in the apheresis plasma donors who experienced a VVR (P<0.001). In terms of environmental factors, the VVR rate for WB donations was low but was significantly higher at the satellite facility compared to the main hospital site (0.57% vs. 0.30%, P=0.003), possibly due to temperature, ventilation or phlebotomy space or characteristics of the donors who visited this site. 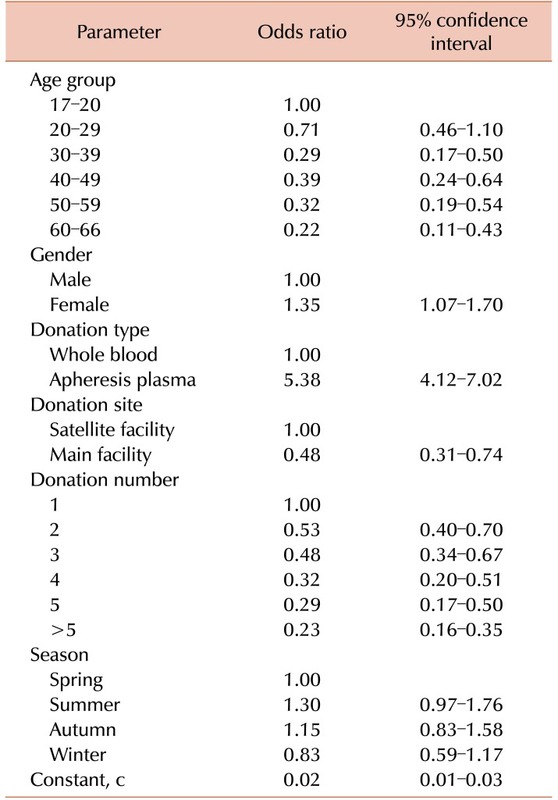 There was also a trend towards higher VVR rates for both WB and apheresis plasma donations during the summer versus other seasons combined, but this did not reach statistical significance likely due to the low number of events (Table 1). Comparing donation volume, the VVR rate was 11% in WB donations with a volume less than 405 mL, possibly due to the adverse event during the process, compared to 0.07% in donations with a volume between 405–495 mL (P<0.001). For apheresis plasma donations, there was a lower VVR rate associated with the donation volume of 650–750 mL compared to volume of 550–650 mL (0.48% vs. 0.72%, P=0.037). In fact the VVR rate for apheresis plasma donations with a volume less than 550 mL was significantly higher at 11.1% (P<0.001 vs. a volume of ≥550 mL), due to the premature termination of the collection caused by occurrence of VVR. Almost 90% of all VVRs occurred during the first two donations for WB donors and almost 75% of VVRs occurred during the first three apheresis plasma donations. Fig. 2 shows that the VVR rate was the highest on donation number one for both WB and apheresis plasma donations (dashed lines). 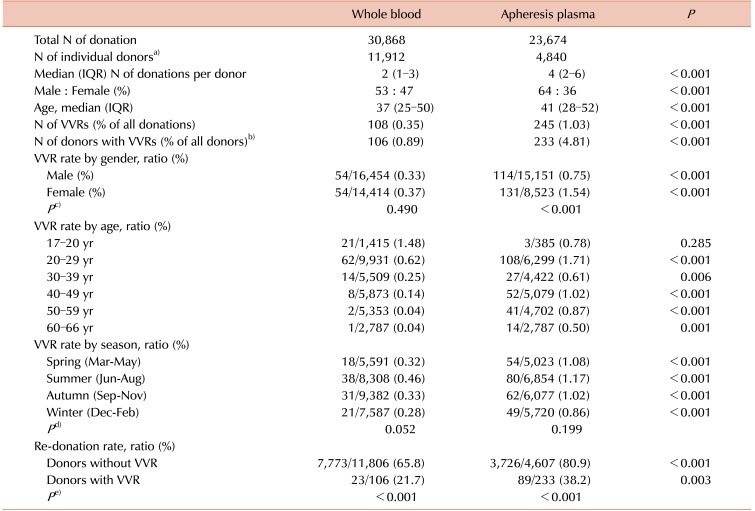 The re-donation rate was three-fold lower in WB donors (21.7% vs. 65.8%) and two-fold lower (38.2% vs. 80.9%) in apheresis plasma donors with experience of VVR compared to donors without VVR (P<0.001 for both comparisons) (Table 1). The results of the clustered multivariate regression model are shown in Table 2. Apheresis plasma donors had higher odds ratio for experiencing a VVR compared to WB donors. Female donors also had a higher likelihood of experiencing a VVR compared to male donors. The odds ratio for experiencing a VVR decreased with increasing age and with higher donation numbers. The main hospital donation site was associated with a lower odds ratio for having a VVR compared to the satellite collection facility but the odds ratio for a seasonal effect was not significant. The analysis performed in this study was limited to the variables captured in the donation registry, and as such, the inability to account for the effect of factors such as donor weight, ethnicity, first-time donation status, history of VVRs, waiting time, time since last meal and pre-donation psychometric variables is potentially a limitation. Additionally, not all of the donation-related parameters were available for all the donations included in the study. Nonetheless, this study confirms the findings of prior studies that younger age and female gender are associated with a higher rate of VVR, regardless of the donation type. The majority of VVRs occurred on the first documented donation in the study period and there was a significantly lower redonation rate after a VVR event for both WB and apheresis plasma donors. The unexpected finding of a higher VVR rate associated with an apheresis donation volume of 550–650 mL versus 650–750 mL is likely because the volume collected for apheresis donations was based on donor weight and donors with lower weight have a higher reported rate of VVRs, and/or that the occurrence of a VVR caused the premature termination of the collection . These findings highlight the importance of identifying risk factors for donor VVRs in order to take steps to mitigate these reactions and thereby encourage re- donations. Donors identified to be at risk of VVR should be monitored more closely in order to improve the donor experience. Donor hemovigilance registries should collect data on additional parameters potentially associated with VVRs. Vasovagal reaction (VVR) rate stratified by donation type, age group and gender. The average VVR rate was not different between males and females for whole blood donations (<=0.490), but there was a trend towards a higher rate of VVRs in male whole blood donors less than 30 years of age (43/5,030 for males vs. 40/6,233 for females, <=0.192) and female donors greater than 30 years of age (11/11,370 for males vs. 14/8,127 for females, <=0.147). Female apheresis plasma donors experienced a mean VVR rate that was twice as high compared to male plasma donors (P<0.001) and the trend towards higher VVR rates in females was consistent across all age groups. Number and rate of vasovagal reactions (VVRs) stratified by donation number. The solid bars represent the number of VVRs that occurred on each donation number. The dashed line represents the rate of VVRs expressed by donation number for all donors; for example, the rate of VVRs on the first donation recorded for all donors in the registry was 0.6% for whole blood and 2.1% for apheresis plasma donations. The majority of VVRs occurred during the first two donations in the whole blood group and during the first three donations in the apheresis plasma group. No VVR occurred after donation number five in the whole blood group, whereas 33 VVRs occurred during donation numbers six and twenty-one in the apheresis plasma group. Demographics and donor parameters related to all donations with and without VVR. a)There were 4,164 donors who donated both whole blood and apheresis plasma. b)Three donors who donated both whole blood and apheresis plasma donations experienced VVRs with both donation types. c)These P-values compare the VVR rates between male and female whole blood donors, and male and female apheresis plasma donors. d)These P-values compare the rates of VVRs during summer versus the other three seasons combined for whole blood and apheresis plasma donations. e)These P-values compare the re-donation rates between whole blood and apheresis plasma donors donors with and without VVRs. Abbreviations: VVR, vasovagal reaction; IQR, interquartile range. Summary of logistic regression analysis for variables predicting a vasovagal reactiona). a)in 54,542 whole blood and apheresis plasma donations from 11,912 individual whole blood donors and 4,840 individual apheresis plasma donors (4,164 donors donated both whole blood and apheresis plasma). The Wald χ2 for the model was 369.29 with 16 degrees of freedom (P<0.001). Wiersum-Osselton, JC, Marijt-van der Kreek, T, Brand, A, Veldhuizen, I, van der Bom, JG, de Kort, W. Risk factors for complications in donors at first and repeat whole blood donation: a cohort study with assessment of the impact on donor return. Blood Transfus, 2014;12;s28-s36. Sorensen, BS, Johnsen, SP, Jorgensen, J. Complications related to blood donation: a population-based study. Vox Sang, 2008;94;132-137. Burkhardt, T, Dimanski, B, Karl, R, et al. Donor vigilance data of a blood transfusion service: A multicenter analysis. Transfus Apher Sci, 2015;53;180-184. Newman, B, Tommolino, E, Andreozzi, C, Joychan, S, Pocedic, J, Heringhausen, J. The effect of a 473-mL (16-oz) water drink on vasovagal donor reaction rates in high-school students. Transfusion, 2007;47;1524-1533. Crocco, I, Franchini, M, Garozzo, G, et al. Adverse reactions in blood and apheresis donors: experience from two Italian transfusion centres. Blood Transfus, 2009;7;35-38. Winters, JL. Complications of donor apheresis. J Clin Apher, 2006;21;132-141. Eder, AF, Dy, BA, Kennedy, JM, et al. The American Red Cross donor hemovigilance program: complications of blood donation reported in 2006. Transfusion, 2008;48;1809-1819. Eder, AF, Hillyer, CD, Dy, BA, Notari, EP, Benjamin, RJ. Adverse reactions to allogeneic whole blood donation by 16- and 17-year-olds. JAMA, 2008;299;2279-2286. Wiltbank, TB, Giordano, GF, Kamel, H, Tomasulo, P, Custer, B. Faint and prefaint reactions in whole-blood donors: an analysis of predonation measurements and their predictive value. Transfusion, 2008;48;1799-1808. Rios, JA, Fang, J, Tu, Y, et al. The potential impact of selective donor deferrals based on estimated blood volume on vasovagal reactions and donor deferral rates. Transfusion, 2010;50;1265-1275. Bravo, M, Kamel, H, Custer, B, Tomasulo, P. Factors associated with fainting: before, during and after whole blood donation. Vox Sang, 2011;101;303-312. Fisher, SA, Allen, D, Dorée, C, Naylor, J, Angelantonio, ED, Roberts, DJ. Interventions to reduce vasovagal reactions in blood donors: a systematic review and meta-analysis. Transfus Med, 2016;26;15-33. Newman, B, Siegfried, B, Buchanan, L. Are vasovagal reaction rates in blood donors related to the duration of the phlebotomy?. Transfusion, 2008;48;568-569. Ditto, B, France, CR. Vasovagal symptoms mediate the relationship between predonation anxiety and subsequent blood donation in female volunteers. Transfusion, 2006;46;1006-1010. Takanashi, M, Odajima, T, Aota, S, et al. Risk factor analysis of vasovagal reaction from blood donation. Transfus Apher Sci, 2012;47;319-325.